Clients include local, regional and national private equity investors; public pension funds; and public and private REITs. And the highest number of apartment transactions by any Indianapolis brokerage firm. Annually Presents the Indiana Apartment "Industry Outlook"
An event hosted in conjuction with the Indiana Apartment Association. Tikijian Associates is pleased to have arranged the sale of a five-property portfolio totaling 1,983 units in Indianapolis. 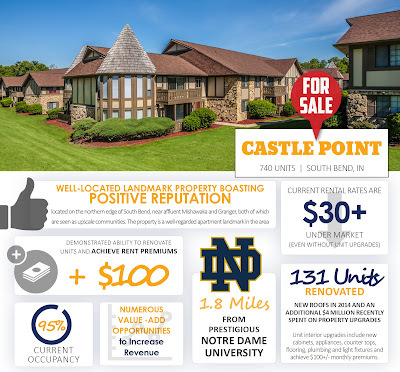 The sale is believed to be the largest portfolio sale to a single buyer in Indianapolis in this millennium. 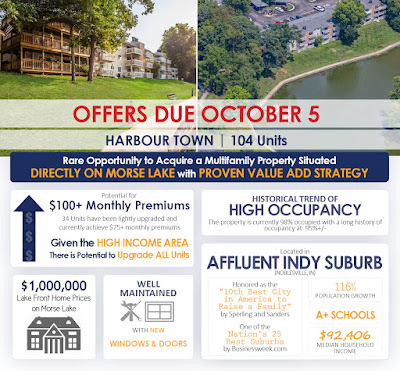 The sale included Indianapolis’ largest apartment community, Westlake Apartments with 1,381 units. Tikijian Associates represented the seller, Hampshire Properties headquartered in Brooklyn, New York. The seller acquired the properties in multiple transactions in 2008 from Aimco when the large REIT decided to exit several Midwestern states. The properties have been managed by Flaherty and Collins, a well-respected property management firm based in Indianapolis. The buyer was The Wilkinson Corporation, based in Yakima, Washington. Since its founding in 1991, Wilkinson has acquired more than 120 properties, developed or co-developed sixteen more, and has a portfolio valued at over $1.7 billion. The buyer plans over $29M in capital investment including upgrades of unit interiors and common areas as well as enhancement of amenities. Tikijian Associates is a market-leading boutique brokerage firm specializing exclusively in the sale of multifamily properties throughout Indiana. The sale of the five property portfolio brings the firm’s sold property total to 28 in 2018, totaling over 7,300 units and more than $550 million in value. Tikijian Associates represented the seller, Shamrock Communities. The buyer was Atlanta-based The RADCO Companies. Founded in 1994, RADCO now owns more than 50 apartment communities in nine states totaling almost 19,000 units. The buyer plans significant capital investment in the properties, including upgrades of unit interiors and common areas and enhancement of amenities. Tikijian Associates is a market-leading boutique brokerage firm specializing exclusively in the sale of multifamily properties throughout Indiana. The company has sold sixteen properties in the first half of 2018 totaling over 3,700 units and more than $233,000,000 in value. In 2017 Tikijian Associates closed twenty-two apartment sales totaling over 5,900 units and more than $439,000,000. Tikijian Associates is pleased to announce the sale of Atrium Village Apartments, a 116-unit senior community on the east side of Indianapolis. The community was developed in 1981 and 1982 by Lou Jenn, inventor of the Jenn-Air indoor grill. Tikijian Associates represented the seller, CS Acquisitions, an owner and manager based in Lakewood, New Jersey. The buyer was Kent Avenue Group based in Milwaukee, Wisconsin. 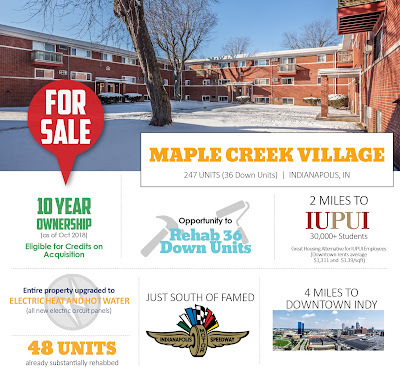 The buyer owns and manages two additional apartment communities in Indianapolis. Tikijian Associates represented the seller, a New York private equity group whose holdings include multifamily properties in Indiana and several other Midwestern, eastern and southeastern states. The buyer was an affiliate of Summit Equity Investments, Inc., based in Los Angeles. Founded in 2009, Summit is a second-generation family office, investor and investment manager. The Company seeks properties offering potential to add value in strong secondary markets throughout the US. The acquisition was Summit’s fifth in the greater Indianapolis area. 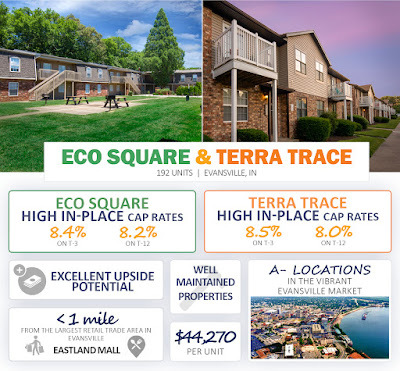 The continued strong demand for multifamily assets in the Indianapolis market was demonstrated by the sixteen offers received, several of which were at or above pricing guidance. 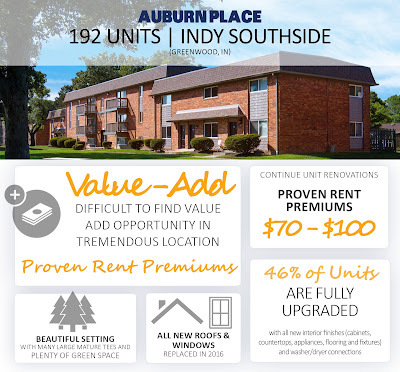 Many investors continue to focus on well-located assets, like Auburn Place, that offer an opportunity to enhance rental revenue through upgrades to unit interiors and amenities. Tikijian Associates is a market-leading boutique brokerage firm specializing exclusively in the sale of multifamily properties throughout Indiana. The sale of Auburn Place was the company’s twenty-second sale in 2018, totaling over 5,100 units and more than $310,000,000 in value. Tikijian Associates represented the seller, Domo Development. 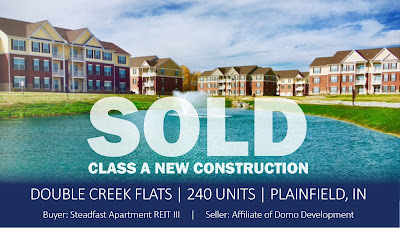 Domo is a developer of class A luxury apartment communities with properties in the Indianapolis area as well Fort Wayne and Lafayette, Indiana. 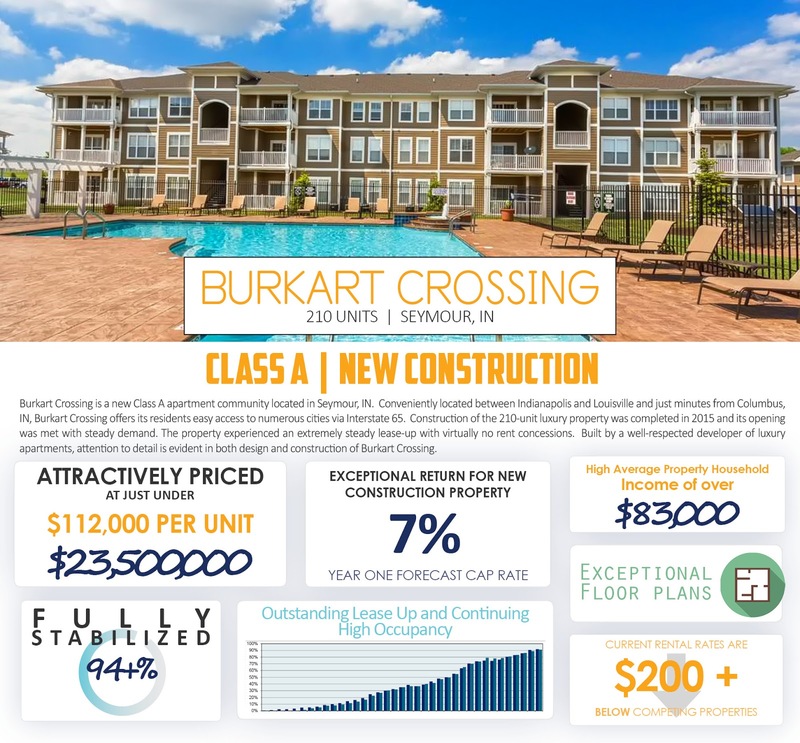 Double Creek Flats was completed in 2016 and experienced a very successful lease-up. The community was managed for the seller by Indianapolis-based Flaherty & Collins. The buyer Steadfast Apartment REIT III, is based in Irvine, California. The acquisition was the buyer’s seventh multifamily investment in the Greater Indianapolis Metro area. Steadfast is an active apartment operator throughout the country with a portfolio under their management / ownership of approximately $5.0 billion with over 38,000 units in 23 states. Tikijian Associates is pleased to announce the sale of two apartment communities in the city of Elkhart, in northern Indiana. The properties, 230-unit Carriage House Apartments and 190-unit Williamsburg on the Lake Apartments, are adjacent to one another. Slightly less than 40% of the units are subsidized through HUD project-based Housing Assistance Payments (HAP) contracts. Tikijian Associates represented the seller, a Brooklyn, New York investor that acquired the property in early 2016. The buyer is a private investor based in Monterey, California. The acquisitions were the buyer’s first in Indiana. Indianapolis-based Flaherty & Collins, who served as manager for the seller, will continue to manage for the buyer. Tikijian Associates is a market-leading boutique brokerage firm specializing exclusively in the sale of multifamily properties throughout Indiana. 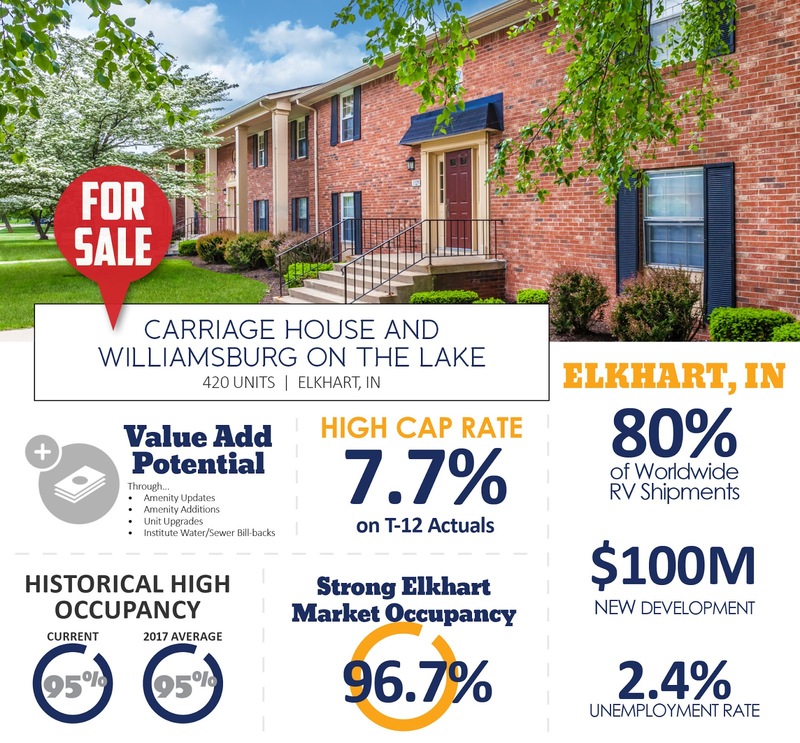 The sale of Carriage House and Williamsburg on the Lake are the company’s twentieth and twenty-first apartment sales in the first eight months of 2018, totaling over 4,500 units and more than $295,000,000 in value. 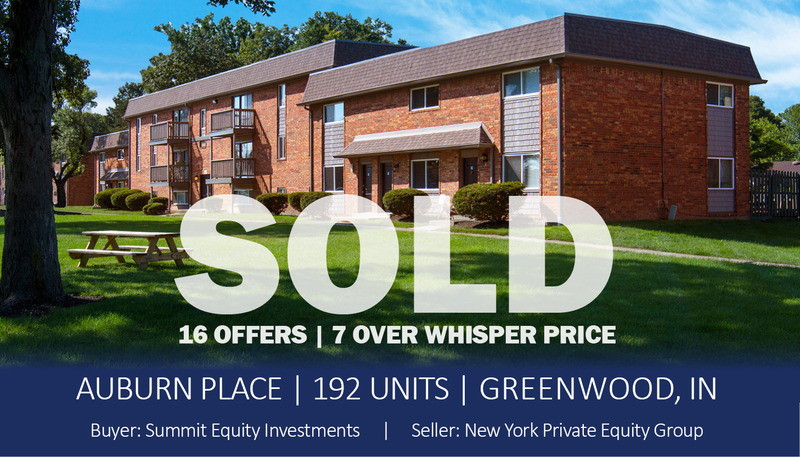 Tikijian Associates is pleased to have represented the seller in the sale of Towne View Apartments, an 88-unit community in Mooresville, Indiana. Mooresville is a suburban community just 15 miles southwest of Indianapolis. The seller was Mooresville-based Double Play Investments. Built in 1995 as an affordable housing property, Towne View was purchased by the seller in 2009 and transitioned to an all market-rate community. The buyer was Renewing Management, an Indianapolis-based owner and manager with a mission “to restore hope by transforming communities across Indiana”. The company fulfills this mission through the acquisition, management and rehabilitation, if needed, of multifamily properties. Tikijian Associates is pleased to announce the sales of 153-unit Heritage Apartments and 92-unit Sassafras Hill Apartments, in Bloomington, IN. Bloomington is home to Indiana University, a major university with enrollment of more than 43,000 students. Tikijian Associates represented the seller, Champaign, Illinois based Regency Multifamily. Since its formation in 1974, Regency has purchased and developed over 15,000 apartments. In 2001, Regency successfully sold most of its portfolio to a national REIT. Today the company is again positioned for growth, and currently, has more than 3,000 apartments throughout the Midwest. The company, owns, manages and develops in select secondary and tertiary markets and is buying class A properties with several recent acquisitions. The buyer was Hunter Properties, a real estate investment and management firm headquartered in Evanston, Illinois. 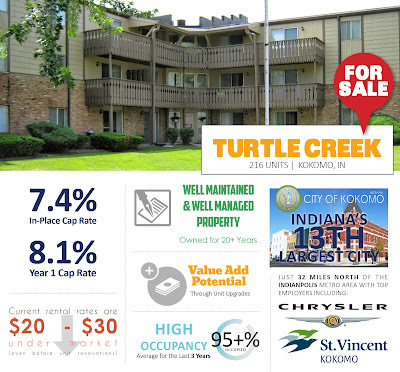 The buyer’s portfolio includes several apartment properties in Lafayette, Indiana. These acquisitions were Hunter’s first in Bloomington. The properties will be managed by the buyer’s affiliated management company. Tikijian Associates is a market-leading boutique brokerage firm specializing exclusively in multifamily sales throughout Indiana. The firm’s sales total over 91,000 units and more than $3.4 Billion. 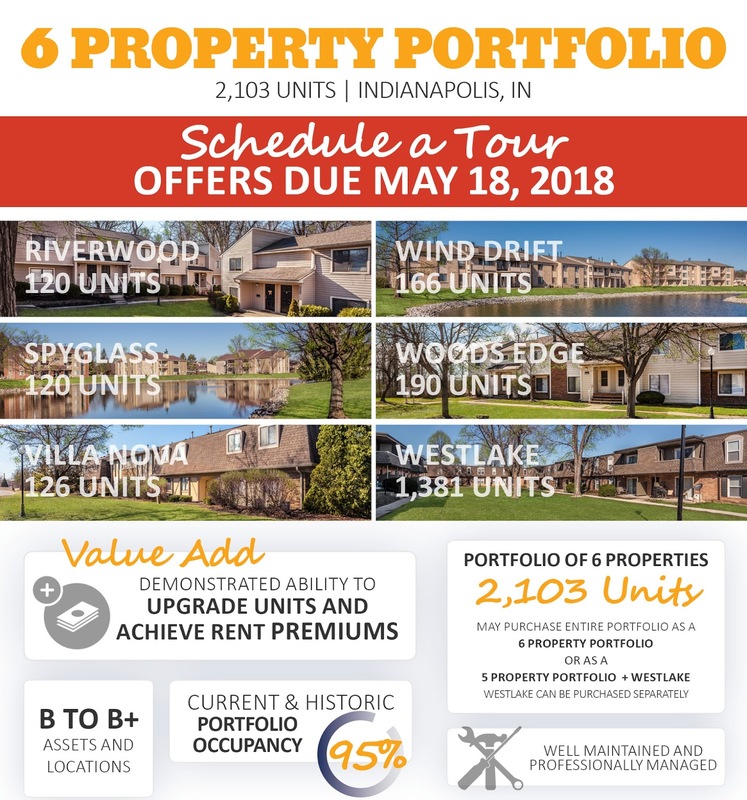 Tikijian Associates is pleased to announce the sale of The Win, a new Class “A” luxury apartment community located on Indianapolis’ Northside. 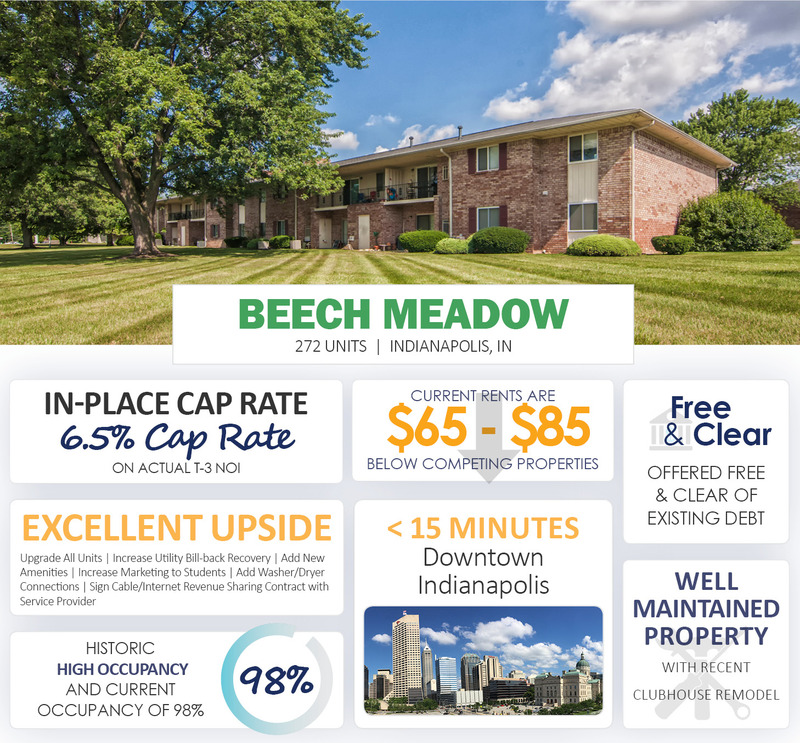 Because of its outstanding location and high-end finishes, the per-unit sale price of the property was the highest on record for an apartment property outside of downtown Indianapolis CBD. The Win is located in the heart of Broad Ripple, one of Indianapolis’ most popular entertainment and residential areas. Due to its wide variety of restaurants, bars, live entertainment venues and eclectic shops, Broad Ripple is extremely popular with college students and young adults, both single and with families. Broad Ripple has been designated as one of Indianapolis’ six official cultural districts. Tikijian Associates represented the seller, locally-based developer, Central Living. The seller built The Win in 2016-2017. The buyer is CrestHawk Properties. Based in Englewood, Colorado. CrestHawk’s principal has developed more than 3,000 homes and several apartment communities in the Denver area. The buyer has chosen respected and locally based developer and manager The J.C. Hart Company to manage The Win. The acquisition, which closed in January, was the buyer’s first in Indiana. 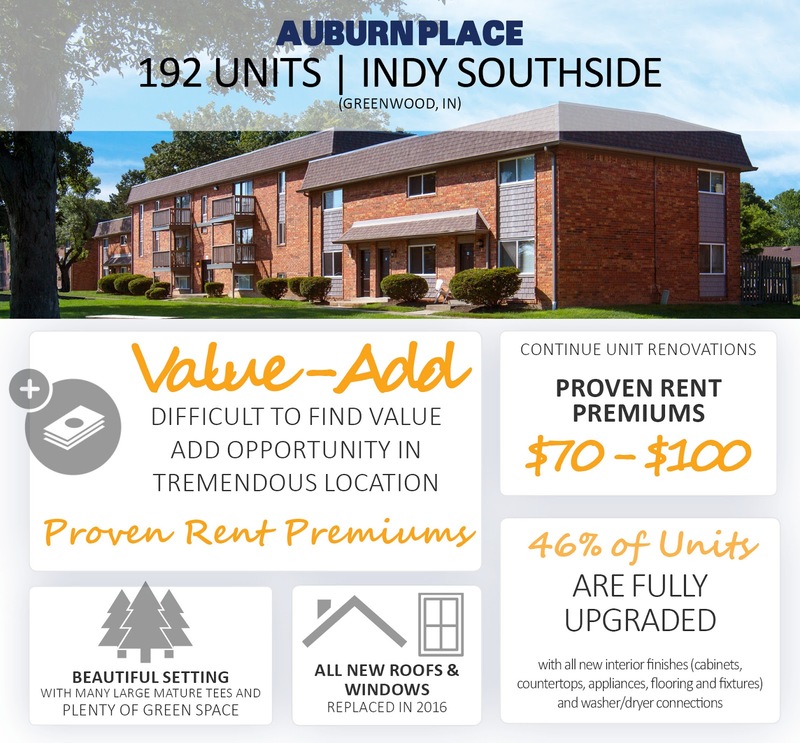 Tikijian Associates is pleased to announce the sale of Pinewood Village Apartments, an 81-unit community in Speedway, Indiana. Tikijian represented the seller, a private investor from Irvine, California. 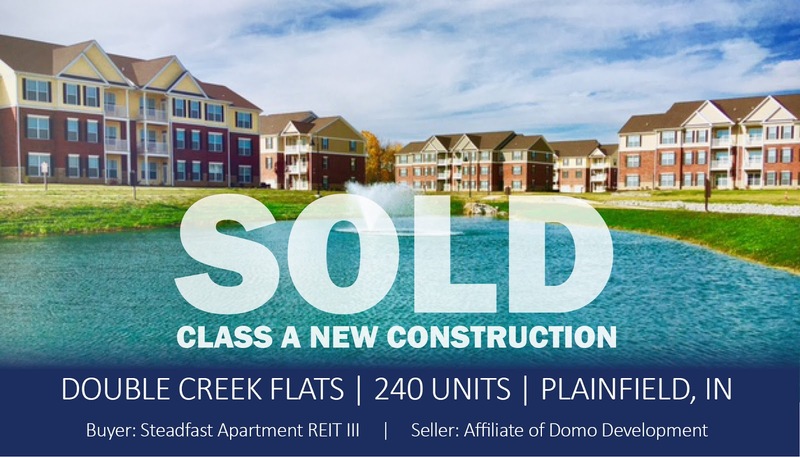 Tikijian Associates is pleased to announce the sale of Flats at Switch, a 102-unit Class “A” luxury apartment community located in emerging Fishers, Indiana. Popular, affluent and rapidly growing, the City of Fishers (a northern suburb of Indianapolis) was named the “Best Place to Live in America” by CNN/Money magazine in 2017. The sale involved three of Indianapolis’ most high profile and well-respected development companies. Tikijian Associates represented the seller, a joint venture of TWG Development and Loftus Robinson. Founded in 2007, TWG has completed $333 million in development, has $184 million under construction and an additional $154 million in the planning stage. Loftus Robinson, founded in 2012 and located in downtown Indianapolis, is a developer of innovative and distinctive multifamily, office, hotel and mixed-used properties. With over $100 million under development, the company focuses on the developing properties with character, walkability, and sustainability. The buyer was The J.C. Hart Company, one of central Indiana’s largest apartment developers. Founded in 1976, the company customarily builds its own properties, but was attracted to Flats at Switch due to the property’s upscale design and outstanding location. Tikijian Associates is a market-leading boutique brokerage firm specializing exclusively in the sale of multifamily properties throughout Indiana. The company has sold sixteen properties in the first half of 2018 totaling over 3,700 units and more than $233,000,000 in value. In 2017, Tikijian Associates closed twenty-two apartment sales totaling over 5,900 units and more than $439,000,000. 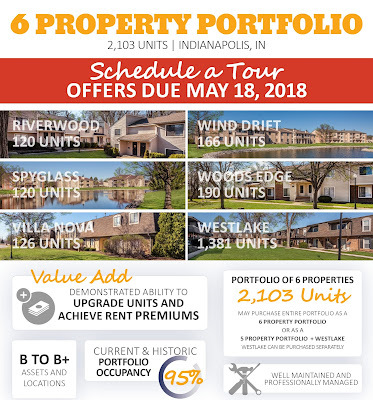 Tikijian Associates is pleased to announce the sale of Bailey Park of Brownsburg Apartments, a 66-unit Class A independent living senior apartment community located in growing Brownsburg, Indiana, just west of Indianapolis. Tikijian Associates represented the seller, a joint venture of Whitmore Investments and Indianapolis-based developer Paragus. 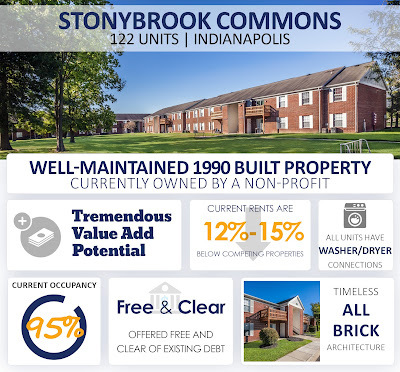 The seller completed construction of Bailey Park of Brownsburg in 2015. The community is designed for “55 and better” residents and features spacious ground-level units, each with an attached garage. The buyer was an affiliate of Summit Equity Investments, Inc., based in Los Angeles. Founded in 2009, Summit is a second-generation family office investor and investment manager. The Company seeks properties offering potential to add value in strong secondary markets throughout the US. The acquisition was Summit’s fourth in Indianapolis. H-I Management, a respected management company based in Indianapolis which managed the property for the seller, has been retained by the new owner to continue management. The buyer was Hunter Properties, a real estate investment and management firm headquartered in Evanston, Illinois. The properties will be managed by the buyer’s affiliated management company. 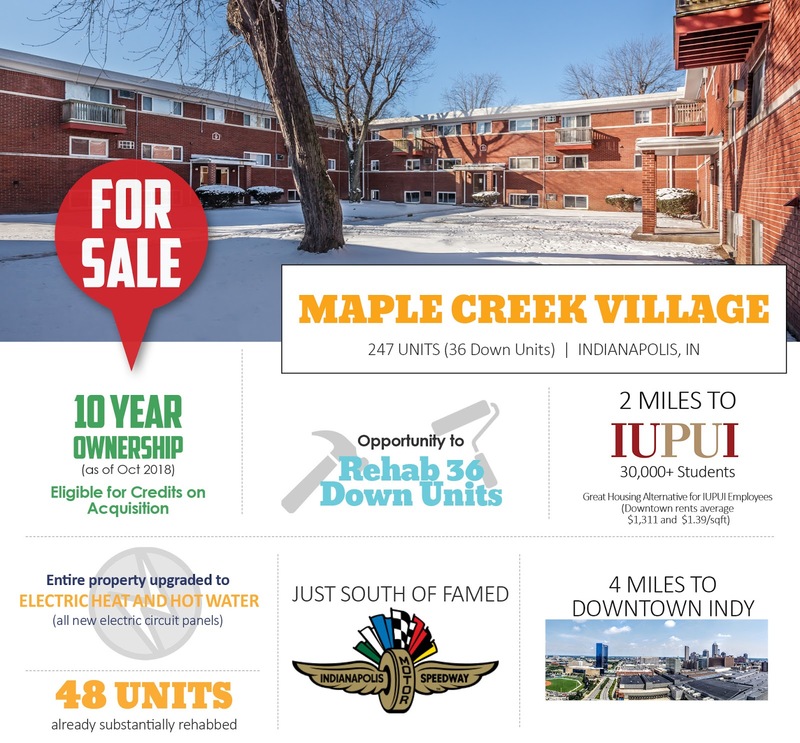 Tikijian Associates is pleased to have arranged the sale of The Cottages of Fall Creek, a 753-unit apartment community located on the northeast side of Indianapolis, Indiana. Originally named Brendon Way, the property was the city’s premier rental community for young professionals in the 1970’s and 1980’s. Tikijian Associates represented the seller, Shamrock Communities in the sale. The buyer was Pike Capital Partners a real estate investment, re-development and management company based in Cleveland, Ohio. 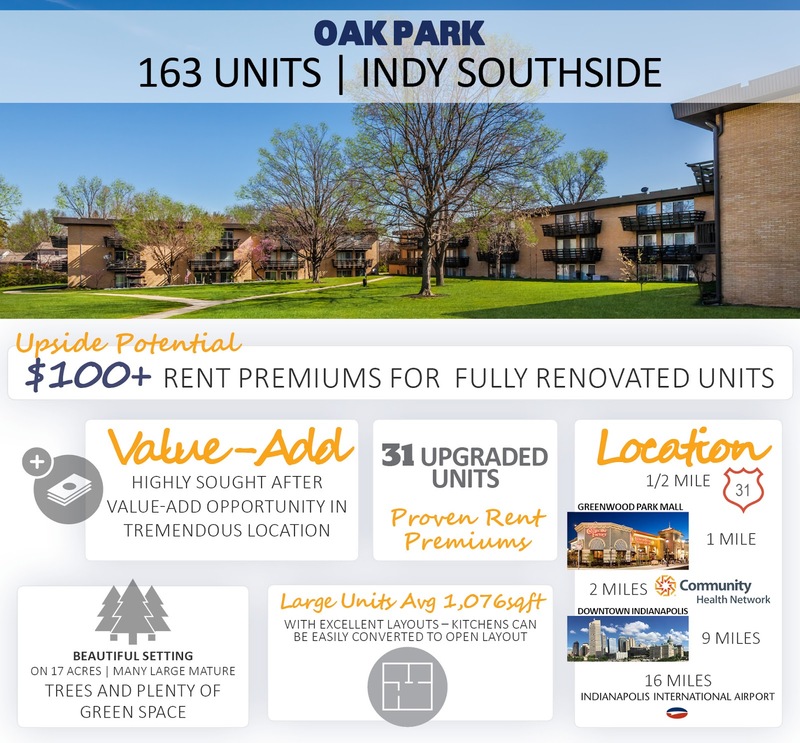 Over the past decade, the firm’s principals have acquired and re-developed over 25,000 apartment homes throughout the Midwest and Southeast, with a cumulative value in excess of $1.5 billion. The buyer will make a significant capital investment in Cottages of Fall Creek, including upgrades of unit interiors and common areas and enhancement of community amenities. 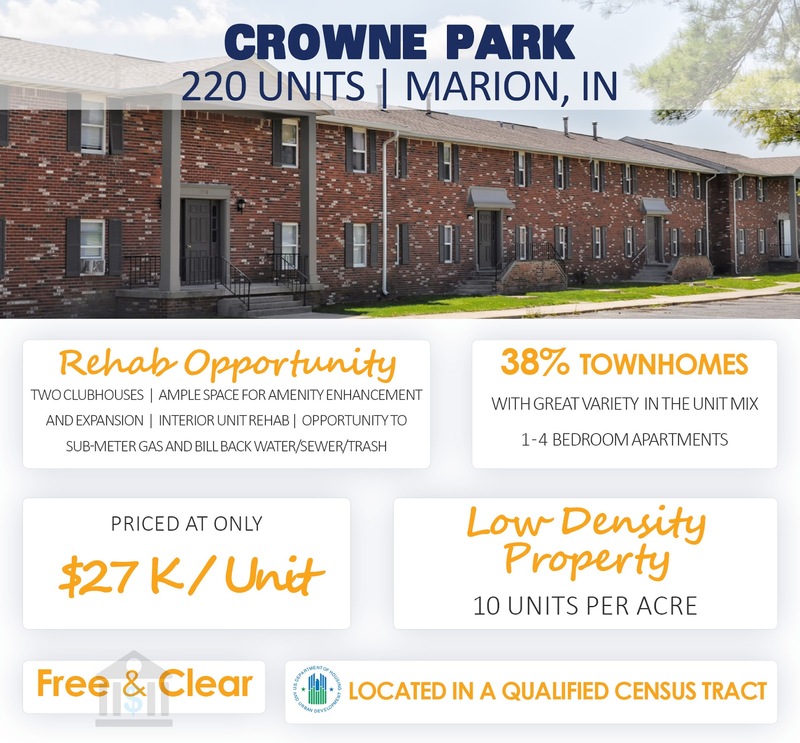 Tikijian Associates is pleased to announce the sale of Phase I of Trotters Pointe Apartments, a 256-unit apartment community located in popular Greenwood, Indiana, just south of Indianapolis. Tikijian Associates represented the Indianapolis-based seller, Pedcor Companies. Founded in 1987, Pedcor develops, owns and manages market rate and affordable housing communities throughout the Midwest and western United States. The company has developed in excess of 16,000 apartment units in seventeen states. Pedcor developed Phase I of Trotters Pointe in 2007 and subsequently built three additional phases expanding the community to 492 units. The buyer is an affiliate of Summit Equity Investments, Inc., based in Los Angeles. Founded in 2009, Summit is a second-generation family office investor and investment manager. The Company seeks properties offering potential to add value in strong secondary markets throughout the US. The acquisition was Summit’s third in Indianapolis. 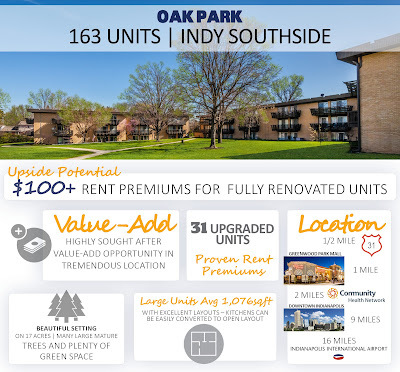 The buyer has re-named the community “Summit Pointe” and plans to continue upgrades of unit interiors which were begun by the seller. Greystar will manage the property for the new owner. 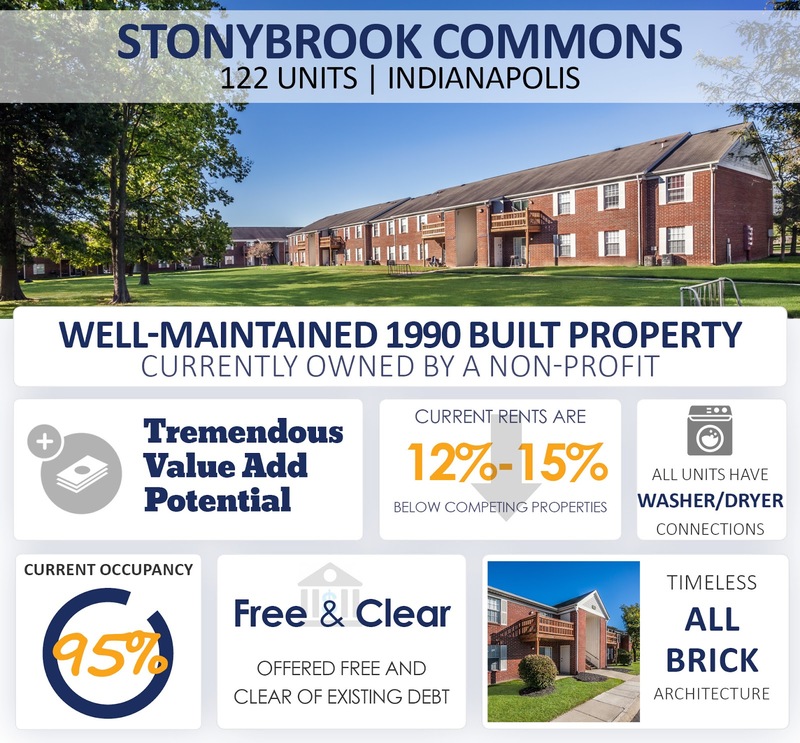 Tikijian Associates is pleased to have represented the seller in the sale of Stonebrook of Franklin Apartments, a 46-unit community in Franklin, Indiana. Franklin is a suburban community just 20 miles due south of Indianapolis. Tikijian Associates represented the seller, Renewing Management, an Indianapolis-based owner and manager. The buyer was Skyline Real Estate Investments. Skyline acquires and manages apartment communities in Colorado and select other markets. The acquisition was the buyer’s first in Indiana. Indianapolis based Birge & Held will manage Stonebrook of Franklin for the new owner. Tikijian Associates is a market-leading boutique brokerage firm specializing exclusively in the sale of multifamily properties throughout Indiana. 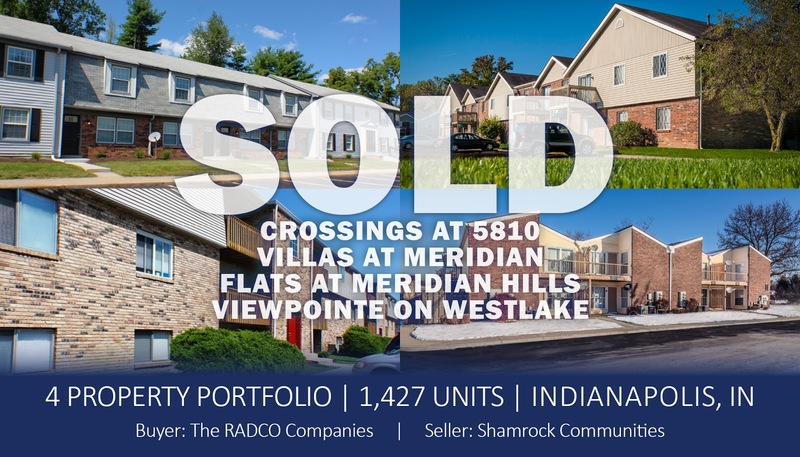 Tikijian Associates is pleased to have represented the seller in the sale of Scatterfield Villas Apartments, a 56-unit community in Anderson, Indiana. Anderson is a suburban community just 30 miles northeast of Indianapolis. Tikijian Associates represented the seller, Renewing Management, an Indianapolis-based owner and manager who restores hope by transforming communities across Indiana. Renewing Management bought the property (then named Autumn Winds) in the spring of 2015 and performed a significant rehab during its ownership, including, updating interiors of all of the units. The seller also re-named the property Scatterfield Villas. The buyer, Scatterfield FT, LLC is based in Wintersville, Ohio. The acquisition was the buyer’s first multifamily investment. 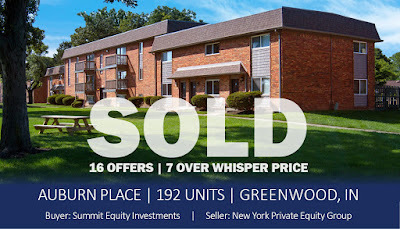 Tikijian Associates is pleased to have represented the seller in the sale of Flats at Fishers Marketplace, a 306-unit Class “A” luxury apartment community located in Fishers, Indiana. Popular, affluent and rapidly growing, the City of Fishers (a northern suburb of Indianapolis) was named the “Best Place to Live in America” by CNN/Money magazine in 2017. Tikijian Associates represented the Cincinnati-based seller, The Ackermann Group, which developed Flats at Fishers Marketplace between 2014 and 2016 and managed the community until the sale. Founded in the 1940s, Ackermann is a well-respected developer, owner and manager of office, retail, medical, and residential assets. The buyer was a New York based real estate investment firm. Indianapolis-based Flaherty and Collins is managing Flats at Fishers Marketplace for the new owner. Tikijian Associates is a market-leading boutique brokerage firm specializing exclusively in the sale of multifamily properties throughout Indiana. The sale of Flats at Fishers Marketplace was one of twenty-two closed by the firm in 2017, totaling over 5,900 units and more than $439,000,000. 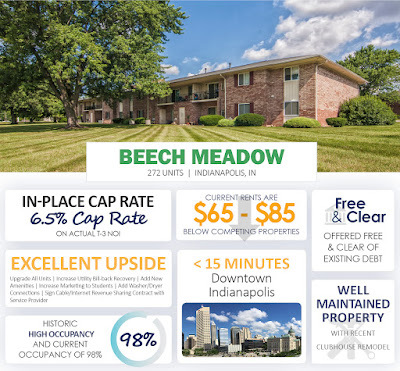 Tikijian Associates is pleased to announce the sale of Fountain Parc Apartments, a 240-unit community on the popular north side of Indianapolis. Tikijian Associates represented the seller, an Indianapolis family that owned and managed Fountain Parc for almost fifteen years. The property has been very well maintained and has an exceptional history of high occupancy. 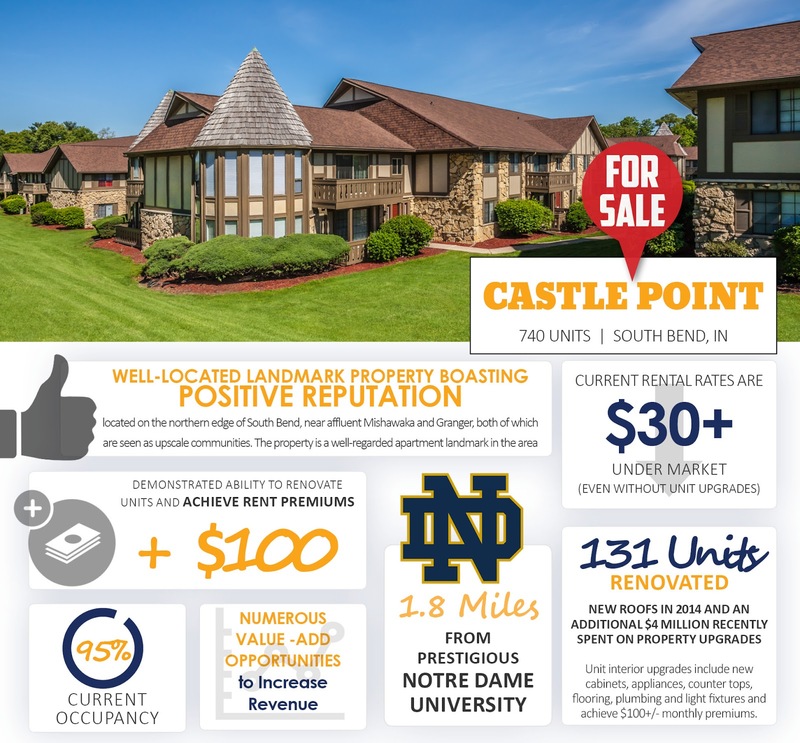 With the exception of units in the process of being turned, the property had been virtually 100% occupied with a waiting list for more than four years prior to the sale. The buyer is an affiliate of Barratt Asset Management, a rapidly growing Indianapolis-based private equity and property management firm. Since its founding in July of 2010, the company has grown to more than $100 million of multifamily assets under ownership and management. The buyer plans to perform significant upgrades of amenities and unit interiors and will oversee the renovations and management internally. Tikijian Associates is a market-leading boutique brokerage firm specializing exclusively in multifamily sales throughout Indiana. The firm’s sales in 2017 totaled more than 5,900 units and more than $439,000,000. 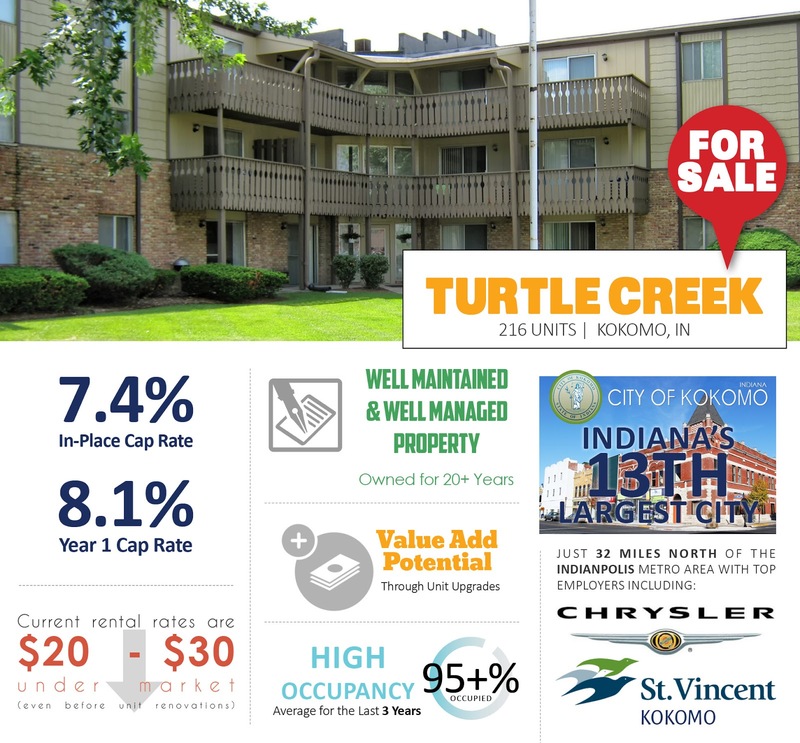 Tikijian Associates is pleased to announce the sale of Village at Curry Pike Apartments, a 38-unit apartment community located in Bloomington, Indiana. Bloomington is located approximately 45 miles southwest of Indianapolis and is the home of Indiana University. 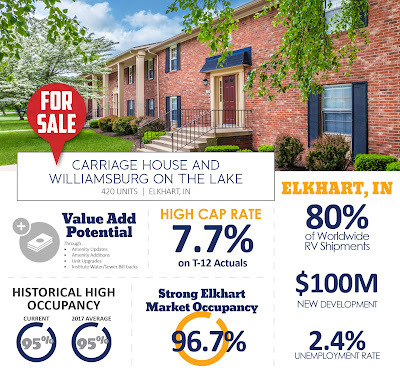 Tikijian Associates represented the seller, Mooresville, Indiana based Grand Slam Investments. The seller acquired Village at Curry Pike out of receivership in late 2014 and stabilized the property following its acquisition. The buyer was TRACOL Holdings, a private real estate investment company based in Robinson, Texas. The purchase was the company’s first in Indiana. TRACOL was represented by David Orton of Marcus and Millichap. Tikijian Associates is a market-leading boutique brokerage firm specializing exclusively in multifamily sales throughout Indiana. 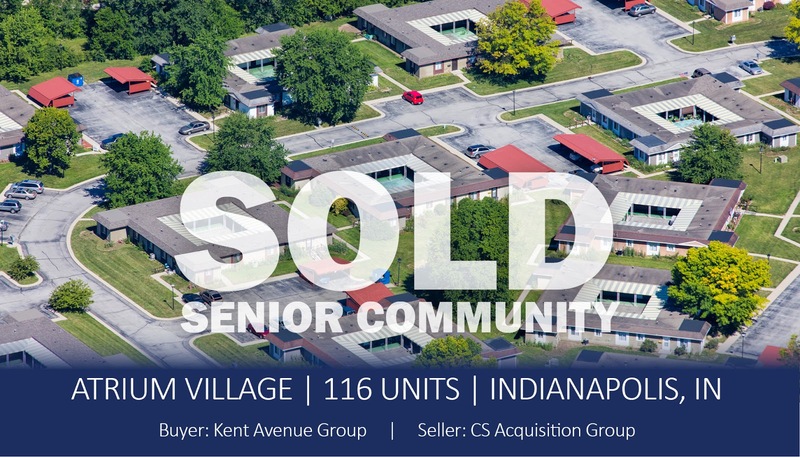 Tikijian Associates is pleased to announce the sale of Arbor Village Apartments, a 94-unit community in Anderson, Indiana, located 30 miles north of Indianapolis. Tikijian represented the seller, CalArbor Investors. CalArbor is an affiliate of Real Wealth Network, based in Walnut Hills, California. Cal Arbor acquired Arbor Village from a lender when it was 100% vacant. The seller completed several major repairs and rehabbed one building (totaling 18 units) before selling the property. The buyer is BLP Indiana, an affiliate of Prodigy Capital. Based in Palm Beach, Florida, Brightlite specializes in the acquisition and rehabilitation of multifamily properties in distress. Since 2012, the company has acquired more than $70 million in distressed properties. 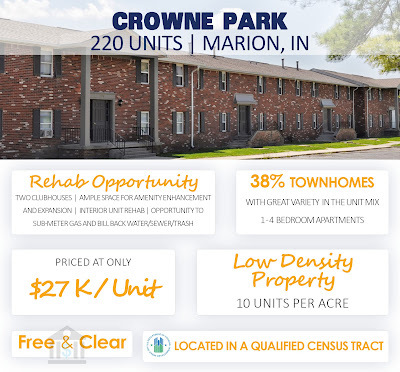 The buyer plans a comprehensive renovation of the property including rehab of the remaining 76 units and improvements to the common areas. 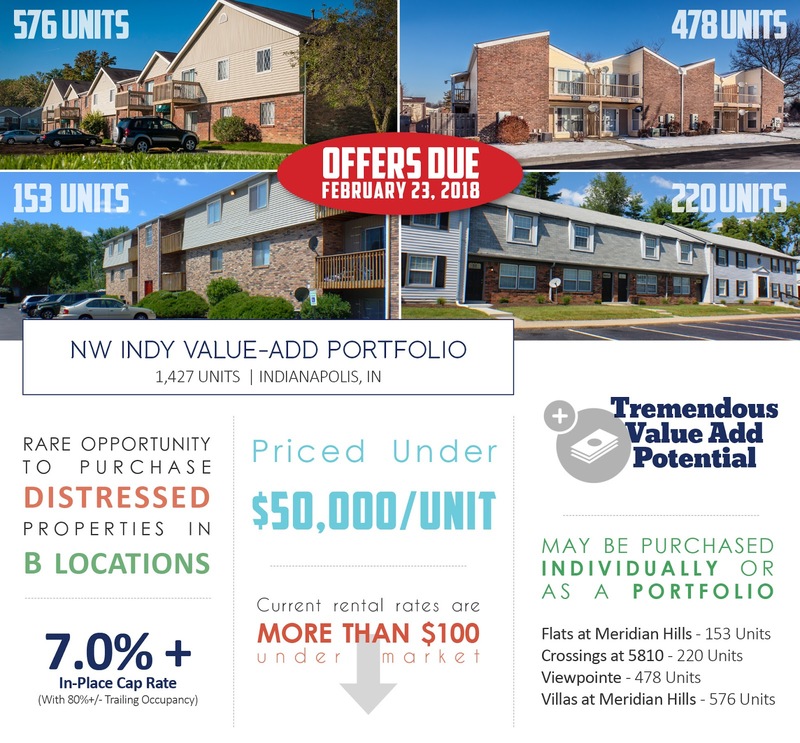 Tikijian Associates is pleased to announce the sale of Avery Point Apartments, a 512-unit community located in the popular Castleton area on the Indianapolis north side. 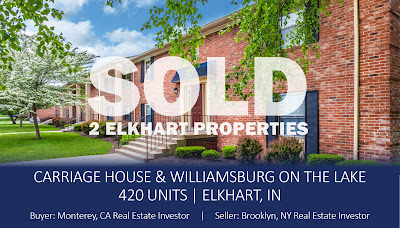 Tikijian Associates represented the seller, a New York private equity group whose holdings include multifamily properties in Indiana and several eastern and southeastern states. The buyer, Steadfast Asset Holdings, Inc., is based in Irvine, California. Avery Point was purchased for inclusion within the Steadfast Real Estate Investment Trust (REIT). The buyer plans interior upgrades to the units including: new flooring, lighting package, fixtures, appliances and counter tops. 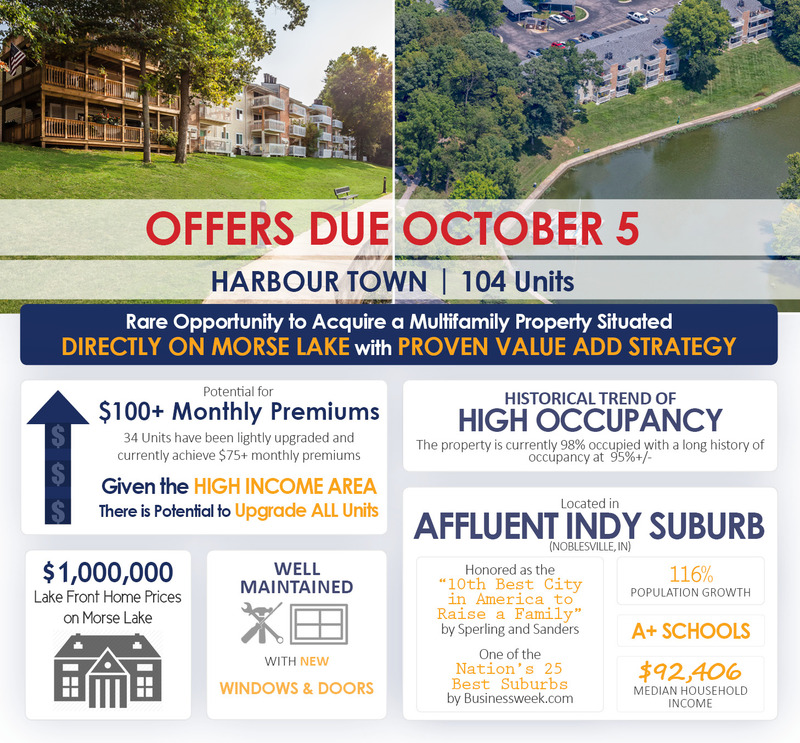 The acquisition was the buyer’s fifth multifamily investment in the Indianapolis area following Lodge at Trails Edge (2013), Harrison Place (2014), Reveal on Cumberland (2015) and Eagle Lake Landing (2015). Steadfast is an active apartment operator throughout the country with a portfolio under their management / ownership of approximately $4.6 billion with over 38,000 units in 23 states. 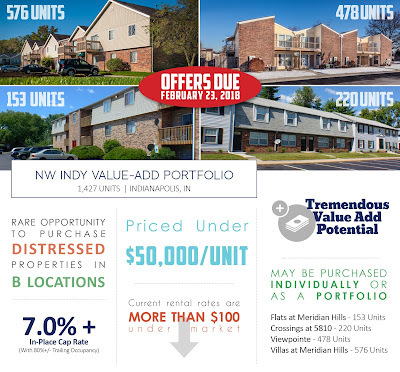 The continued strong demand for multifamily assets in the Indianapolis market was demonstrated by the nearly 20 offers received - 25% of which were at or above pricing guidance. Investors are particularly interested in well-located assets where there is an opportunity to increase value through updates or upgrades to interiors, resulting in the ability to raise rents. Tikijian Associates is a market-leading boutique brokerage firm specializing exclusively in the sale of multifamily properties throughout Indiana. The sale of Avery Point was the firm’s 21st sale of 2017, totaling over 5,700 units and more than $400,000,000.